We have discussed aspects of report design in previous posts, but I was recently asked whether an assessment report should report just one thing or multiple pieces of information. My response is that it depends on the intended use of the assessment results, but in general, I find that a reporting tool is more useful for a stakeholder if it can report multiple things at once. This is not to say that more data are always better. A report that is cluttered or that has too much information will be difficult to interpret, and users may not be able to fish out the data they need from the display. Many researchers recommend keeping simple, clean layouts for reports while efficiently displaying relevant information to the user (e.g., Goodman & Hambleton, 2004; Wainer, 1984). But what information is relevant? Again, it will depend on the user and the use case for the assessment, but consider the types of data we have for an assessment. We have information about the participants, information about the administration, information about the content, and information about performance (e.g., scores). These data dimensions can each provide different paths of inquiry for someone making inferences about the assessment results. There are times when we may only care about one facet of this datascape, but these data provide context for each other, and understanding that context provides a richer interpretation. that the user have control of the report to be able to explore the data as desired. 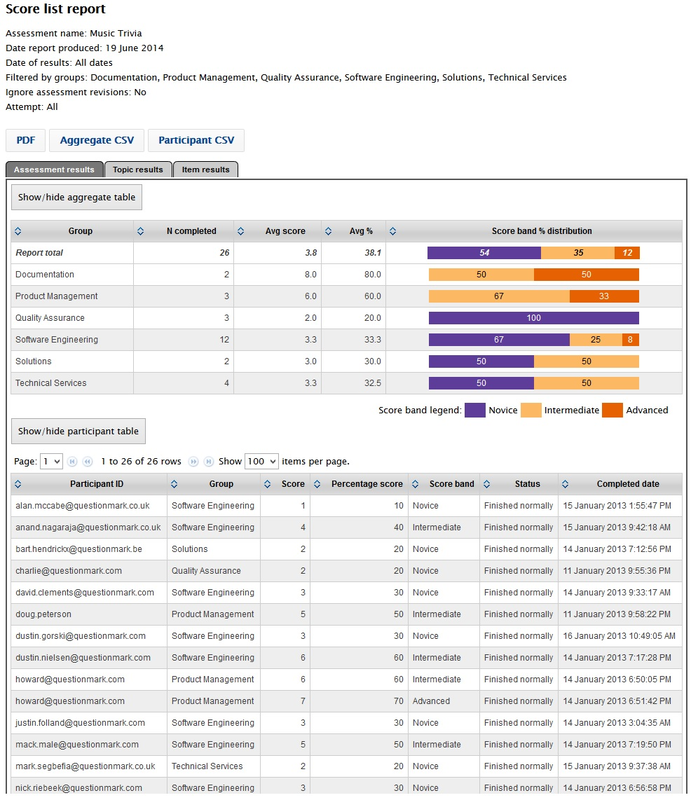 Consider the Questionmark Analytics Score List Report: Assessment Results View. The major theme for the report is to communicate the scores of multiple participants. The report arguably contains five primary chunks of information: aggregate scores for groups of participants, aggregate score bands for groups of participants, scores for individual participants, score bands for individual participants, and information about the administration of the assessment to individual participants. Through design elements and onscreen tools that give the user the ability to explore the data, this report with five chunks of information can provide context for each participant’s score. The user can sort participants to find the high- and low-performing participants, compare a participant to the entire sample of participants, or compare the participant to their group’s performance. The user can also compare the performance of groups of participants to see if certain groups are performing better than others. Online reporting also makes it easy to let users navigate between related reports, thus expanding the power of the reporting system. In the Score List Report, the user can quickly jump from Assessment Results to Topic Results or Item Results to make comparisons at different levels of the content. Similar functionality exists in the Questionmark Analytics Item Analysis Report, which allows the user to navigate directly from a Summary View comparing item statistics for different items to an Item Detail view that provides a more granular look at item performance through interpretive text and an option analysis table. Thanks for the lead J! I updated the link in the post.